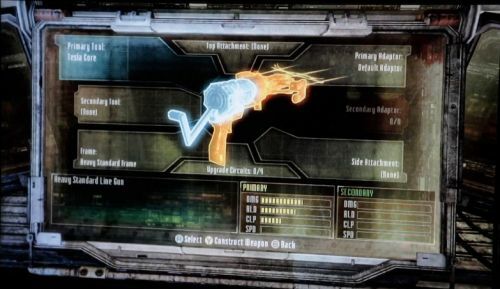 A few days ago I mentioned the new weapon crafting system in Dead Space 3. Players will be able to take parts to a work bench and create a wide variety of tools of destruction. Think of it as a much more elaborate, high-tech, sci-fi version of the duct-taped combo weapons from Dead Rising 2. You can get a feel for the system by visiting the Dead Space website. Issac Clarke and John Carver will have access to several weapon options. Players will be able to apply elemental effects, such as fire and electricity, to bullets or ripper cores. You will even be able to share the blueprints of your favorite creations with friends. Check out the video below to see the crafting system in action. Dead Space 3 supports two player online co-op. It will launch on February 5th for the Xbox 360, PlayStation 3, and PC. Page created in 0.2883 seconds.